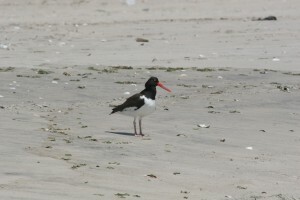 The American oystercatcher is among the top ten priority species of conservation concern for New York City Audubon. This large, conspicuous beach-nesting shorebird eats mainly shellfish and can be seen walking or running along the beach. 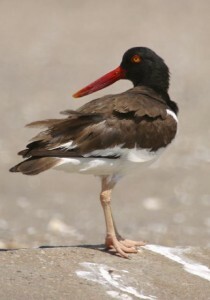 The Atlantic Coast population has decreased dramatically and New York City Audubon is part of a larger regional effort to assess oystercatcher productivity in Jamaica Bay and along the Rockaway Peninsula. Nesting is in full swing. On Friday I accompanied NYC Audubon field technician Emilio Toban as he monitored the beaches at Breezy Point for new nests or hatched eggs. 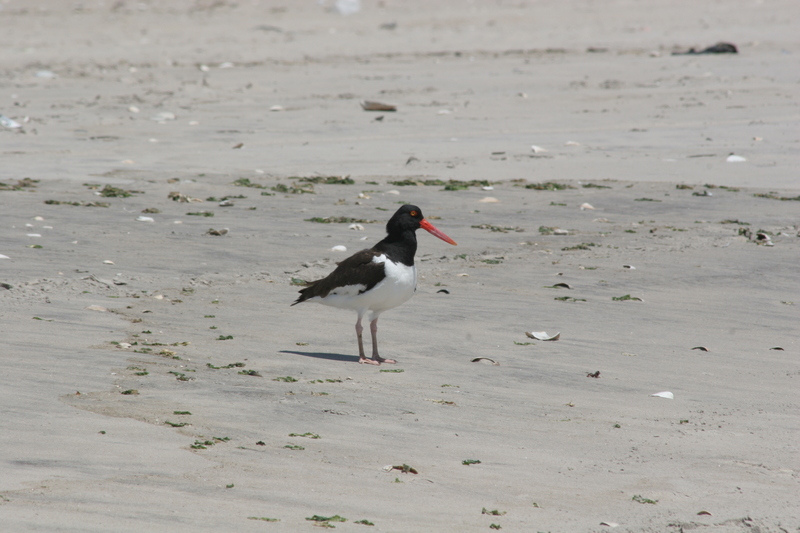 One of the challenges in working with oystercatchers – they share their nesting beaches with endangered piping plovers. Aggressive encounters have been reported, and our partners from Pace and Columbia Universities are part of the team, studying the impact of these behaviors by observing both species. New York City Audubon was happy to participate in NYC Wildflower Week this year, which will wrap up on Sunday May 20th. We hosted a bird walk last weekend in Central Park and on Wednesday of this week we took a crew to the Jamaica Bay Wildlife Refuge in Queens to pull invasive plants, which will give native plants and wildflowers a better opportunity there. After the recent rains the invasive plants were having a field day and our crew removed large amounts of Oriental Bittersweet, Japanese Honeysuckle and Porcelainberry – all while avoiding the native Poison Ivy, which is an important food source for birds in the fall. We thank the Jamaica Bay Unit of the National Park Service for hosting our group and helping to make the event a success. Here come the horseshoe crabs! What’s your idea of the best way to spend a foggy evening in early May? 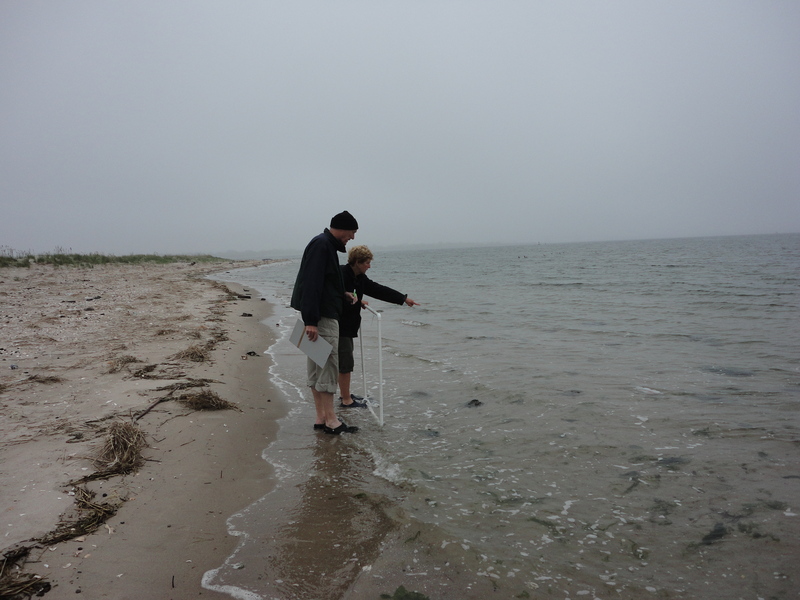 If your answer involves roaming a beach in Jamaica Bay looking for spawning arthropods, then join the crowd! Last night kicked off NYC Audubon’s citizen science horseshoe crab monitoring program for this year and we had crews at three beaches in Jamaica Bay surveying for spawning crabs (of course, in truth the horseshoe crab isn’t a crab, it’s more closely related to spiders and scorpions, but we still use ‘crab’ as the shortened term for them). 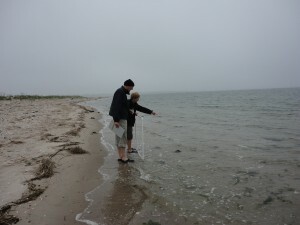 For the fourth consecutive year we are monitoring Brooklyn’s Plumb Beach for spawning and will be collecting a second year of data at Dead Horse Bay (also in Brooklyn) and the beach at Big Egg in Queens. We are interested in the health of Jamaica Bay’s horseshoe crab population because of the reliance of migratory shorebirds on horseshoe crab eggs for food (see an earlier blog post for more information). For three nights around each new and full moon for the next couple of months, dedicated volunteers will brave any and all conditions to collect data that are showing how important Jamaica Bay is for spawning horseshoe crabs. In fact, the data indicate that Jamaica Bay supports the highest densities of spawning horseshoe crabs in the state – not bad for our favorite urban estuary. Kind of makes you want to howl at the moon!